Cochin Shipyard Ltd(CSL) was incorporated in the year 1972 as a fully owned Government of India company. In the last three decades the company has emerged as a forerunner in the Indian Ship building & Ship repair industry. Cochin Shipyard Ltd (CSL) has the capacity to build and repair the largest vessels in India. It can build ships upto 1,10,000 DWT and repair ships upto 1,25,000 DWT. CSL has secured shipbuilding orders from internationally renowned companies from Europe & Middle East and is nominated to build the country’s first indigenous Air Defense Ship. CSL commenced ship repair operations in the year 1982 and has undertaken repairs of all types of ships including upgradation of ships of oil exploration industry as well as periodical lay up repairs and life extension of ships of Navy, UTL, Coast Guard, Fisheries and Port Trust besides merchant ships of SCI & ONGC. The yard has over the years, developed adequate capabilities to handle complex and sophisticated repair jobs. CSL is the largest green field Ship building and Ship repair yard in the country, situated adjacent to the Port of Cochin in the West Coast of India. The yard is built up in 170 acres of land, out of which 60 acres is set aside for future expansion. Cochin Shipyard limited was listed on NSE and BSE on August 11, 2017. Repair of ships / Offshore Rigs etc. In FY18,CSL Total Revenue rose @ 14.39% to Rs.2335.12cr. from Rs.2058.87cr in FY17. PAT has risen to with an impressive rate of 23.39% to Rs.396.75cr in FY2018 as compared to Rs.321.55cr in FY17. Net Worth of Cochin Shipyard Ltd has risen @60.47% to Rs.3,256cr in FY18 as compared to Rs.2,029cr in FY17. And during the same period Capital employed has risen to Rs.3,212cr in FY18 in comparison to Rs.2,089cr in FY17. 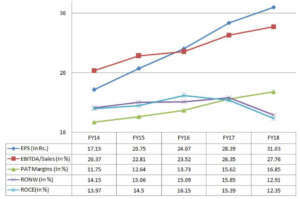 CSL reported an EPS of Rs.31.03 in FY2018 with 9.3% growth in comparison to Rs.28.39 in FY2017.PAT Margins increased by 123bps in FY18 to 16.85% as compared to 15.62% in FY17. For Cochin Shipyard Ltd in FY18, Shipbuilding and Ship repair segment contributed 73.55% and 26.45% to the topline, respectively. Revenues from Shipbuilding rose @14.25% to Rs.1,732cr in FY18 as compared to Rs.1,516cr in FY17. Even Ship Repair revenue rose @14.73% to Rs.623cr in FY18 in comparison to Rs.543cr in FY17. IN Q1FY19, Revenues from Shipbuilding had risen @ 14% to Rs.454.39cr as compared to Rs.398.25cr in Q1FY18. And fallen @9%, when compared to Q4FY18’s revenue of Rs.503cr. 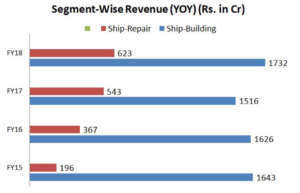 On the other hand, revenues from Ship-Repair segment has risen at an impressive rate of 110% to Rs.204.34cr in Q1FY19 as compared to Rs.97.07cr in Q4FY18. has contracted for the construction of 16 vessels as a pilot project. The total requirement for the department for fishermen is about 2000 vessels. In addition, there are also potential requirements for more bigger and sophisticated vessels for the domestic and international market. This presents a vast opportunity to CSL in this segment. Special Purpose Vessels: Various agencies are looking for modern and efficient vessels to equip and upgrade the assets to meet the operational demands. This gives an opportunity to offer custom made vessels such as Polar Research Vessels, Well Stimulation Vessel, Cement Carriers etc. Inland and Coastal Water Segment: The government’s focus on development of inland and coastal waterways infrastructure is expected to spur demand of ships for this sector. The Government is investing substantial to improve the infrastructure in the major waterways. This will spur the demand for such vessels in the inland water segment. It is estimated that the vessels required to meet the demand by 2030 will triple which may be around 3000+ vessels. CSL is working closely with Inland Water Authority of India (IWAI) and other potential customers to provide efficient product solutions in this segment. The Company has signed a Memorandum of Understanding (MoU) with United Shipbuilding Corporation (USC) which is the largest shipbuilding group in Russia to collaborate and engage in Design, Development and Execution of High-End, State of Art vessels for Inland and Coastal Waterways. Major Expansion Plans: The two major expansion plans of the company include the International Ship Repair Facility (ISRF) at the Cochin Port Trust premises and the new Drydock at the shipyard’s existing premises. These new facilities will expand the Company’s existing capabilities significantly. MoUs Signed– CSL has signed MoUs with Mumbai Port Trust and Kolkata Port Trust for upgradation, operation and management of their Ship repair Facilities by leasing the facilities for 30 years and are in the process of signing binding agreements. By teaming up with the major ports on the eastern and western coasts of India, CSL will be able to leverage its competitive advantage in Ship building and Ship Repair to achieve new heights in the industry by exploiting the wider opportunities in Inland and Coastal Shipping. India’s share in global ship repair market is less than 1%, around 7-9% of global trade is passing within 300 NM of its coastline. India’s strategic position along the east bound and west bound international trade routes offers an opportunity to cater to vessels plying on these routes. A main container route connecting America and Europe to the East passes very close to the Indian coastline presenting a major opportunity for repairs. This presents huge untapped potential which is valued around 3500 to 4000 crore. The captive market for ship repair in India is estimated at around 2500 crore. It is estimated that only 15% of the potential is being tapped presently. Lack of infrastructure and poor ease of doing business due to government regulations and weak ancillary support are the main reasons for failure to tap the above opportunities. As a part of the Sagarmala project, government has embarked on a programme for full utilisation of existing drydockin major ports for providing ship repair services. CSL has entered into an MOU with the Mumbai Port Trust on January 11, 2018 for operations and management of ship repair facility at Indira Dock. CSL shall utilize the facilities for the purpose of ship repair and allied services and for further expansion in the field of ship repair. Similar MOU has been signed with Kolkata Port Trust on March 17, 2018 for operations and management of ship repair facility at Netaji Subhas Dock. Cochin Shipyard being the prime large shipbuilder of Government of India and enjoys a near-monopoly in shipbuilding and ship repair of large vessels. CSL with CMP of Rs.420.10 is trading at a P/E 13.53 and possesses a large order book size combined with very low debt and strong cash flow with huge opportunities in Ship repair and Ship building segment in the near future. 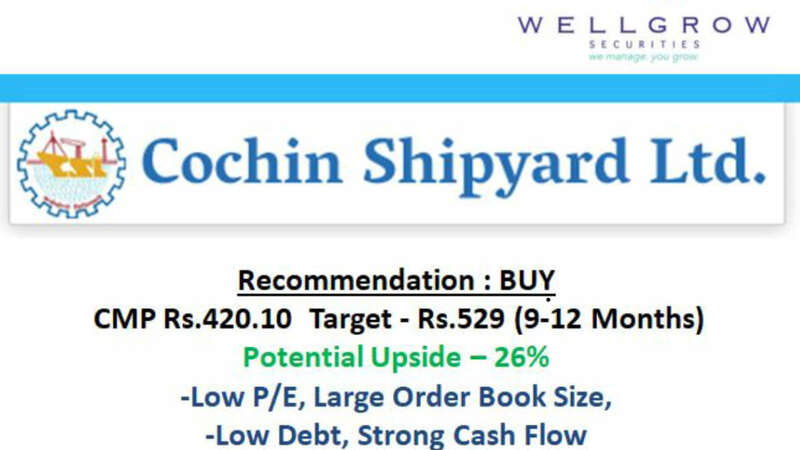 This leads to our target of Rs.529 of Cochin Shipyard with 26% upside potential in 9-12 months going forward. This is solely for information of clients of Wellgrow Securities and does not construe to be an investment advice. It is also not intended as an offer or solicitation for the purchase and sale of any financial instruments. Any action taken by you on the basis of the information contained herein is your responsibility alone and Wellgrow Securities its subsidiaries or its employees or associates will not be liable in any manner for the consequences of such action taken by you. We have exercised due diligence in checking the correctness and authenticity of the information contained in this recommendation, but Wellgrow Securities or any of its subsidiaries or associates or employees shall not be in any way responsible for any loss or damage that may arise to any person from any inadvertent error in the information contained in this recommendation or any action taken on basis of this information. This report is based on the fundamental analysis with a view to forecast future price. 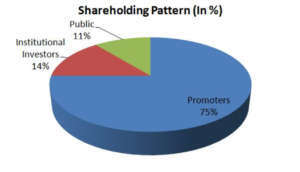 The Research analysts for this report certifies that all of the views expressed in this report accurately reflect his or her personal views about the subject company or companies and its or their securities, and no part of his or her compensation was, is or will be, directly or indirectly related to specific recommendations or views expressed in this report. Wellgrow Securities has based this document on information obtained from sources it believes to be reliable but which it has not independently verified; Wellgrow Securities makes no guarantee, representation or warranty and accepts no responsibility or liability as to its accuracy or completeness. The opinions contained within the report are based upon publicly available information at the time of publication and are subject to change without notice. The information and any disclosures provided herein are in summary form and have been prepared for informational purposes. The recommendations and suggested price levels are intended purely for stock market investment purposes. 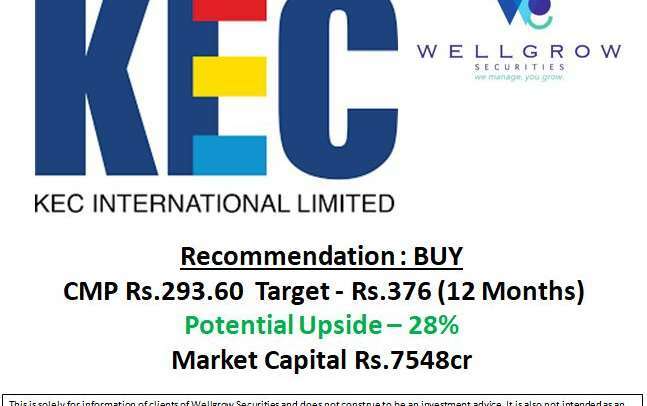 The recommendations are valid for the day of the report and will remain valid till the target period. The information and any disclosures provided herein may be considered confidential. Any use, distribution, modification, copying, forwarding or disclosure by any person is strictly prohibited. 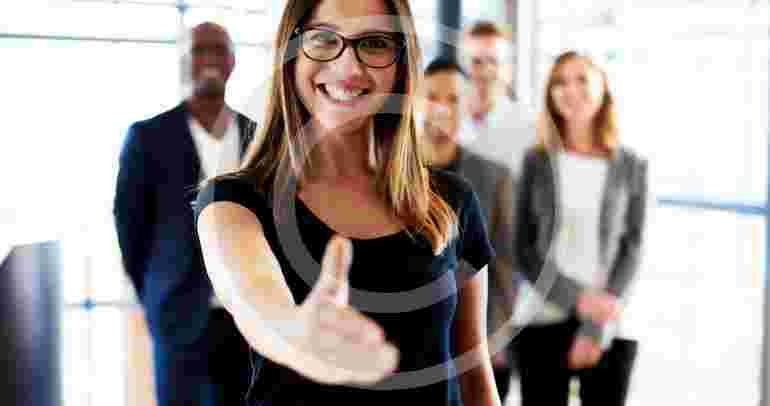 The information and any disclosures provided herein do not constitute a solicitation or offer to purchase or sell any security or other financial product or instrument. The current performance may be unaudited. Past performance does not guarantee future returns. There can be no assurance that investments will achieve any targeted rates of return, and there is no guarantee against the loss of your entire investment.